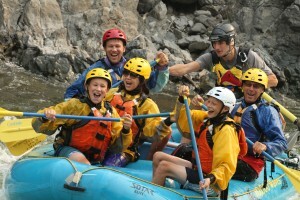 Missoula Whitewater Rafting! 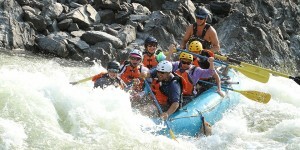 This is our premier whitewater rafting and kayaking run on the Clark Fork River- the finest whitewater in Montana. If you are looking for fun, excitement, and relaxation, then this big volume, big ride river is the one for you. Half-day trips daily: Action packed and affordable. Departs at 9 am daily and returns between 2 pm – 4 pm. Departs at 3:30 pm and returns between 7 pm – 8 pm. The Alberton Gorge, created by Glacial Lake Missoula, is isolated from roads, has magnificent rock formations and dramatic rose-colored cliffs rising vertically on both sides of the river. You will likely see lots of birds, including osprey, mergansers, eagles, kingfishers, and hawks. We may also see deer, bear, moose or elk. History Buffs? All of our guides are well-versed in the history and geological features of the area. Daily departures available May through September. Fleece, splashjackets and wetsuits are provided if needed. 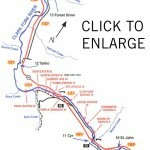 View map of the Clark Fork River, click here. What’s the river flow right now? Click here to find out.